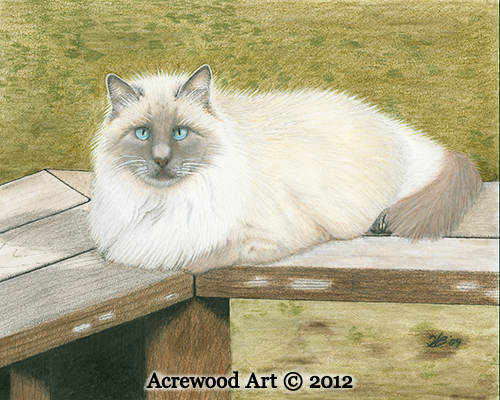 Pooh is the big fluffy Birman kitty that is the mascot of Acrewood Art. In November, 1998, he moved out of the woods at Acrewood onto our front porch and into our hearts. When I heard that Eileen Sorg was going to be teaching another Colored Pencil Stew class at Sitka Center for Art & Ecology, I knew exactly what my subject would be. I had been wanting to draw Pooh, but I wasn't sure about the long fur. I knew the fur and the eyes would be a challenge, but I like that kind of challenge. If you go to the Artist Bio page you can see Pooh helping me draw. You can also read about him on the Story page. 11/9/12 Update: Pooh crossed the Rainbow Bridge today and will be missed greatly. The verse that Kathy chose for his picture back in 2009 seems even more appropriate today -- for all of us.